← Does the Universe Need God? 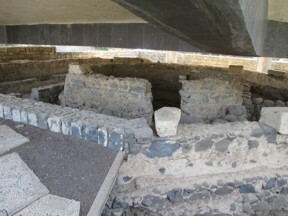 The church has been around for something like 2000 years. Christians have been wrestling with the scriptures, with the nature of God, trying to understand both Christ and Church for two millenia – well over 20 times the length of time any of us will have to wrestle with the issues. We stand on the shoulders of those who have gone before in many ways, and they all have insights from which we can learn much. They are wise who strive to understand those who came before. They are arrogant fools who think they have finally gotten it all right. As a result we do well to consider the thinking of the early church fathers, not because they are authorities who got it right, but because they are fellow believers who strove, as we strive, to follow God. There are at least three powerful reasons this is valuable. 1. We can gain insight into our faith by reading the reflections of fellow Christians of all generations. 2. We can gain insight into the ways culture and context shape the interpretation of scripture. 3. We can gain a better understanding of the everywhere, everyone, always, core of Christian belief. The early Church fathers, we are sure, got somethings wrong. But I will guarantee that there are some significant things that every Christian group everywhere has gotten wrong, including all of us today from, anabaptists to Calvinists. We need humility in our acceptance of current dogmas and pronouncements. Reading Christian thinkers of every generation (and of different “flavors” or tribes) can help us gain perspective. The third chapter of Beginnings: Ancient Christian Readings of the Biblical Creation Narratives by Peter Bouteneff deals with the second century apologists – Ignatius (ok ~ 1st century), Justin, Melito, Theophilus, and most importantly Irenaeus of Lyon. Here we will highlight only Justin and Irenaeus – and concentrate only on their views of Adam and Eve and the primordial sin. In many respects the doctrine of Original Sin is the key conflict in the science and faith debate for many Christians. Adam as primordial man – through whom sin entered into the world, and death through sin – is a central figure. But is is not clear that Adam and Eve as unique individuals played such a key role in the thinking of the early church fathers. How much stock do you think that we should put in the readings and interpretations of the early church fathers? Did they simply err and it took ca. 300 years until Jerome and Augustine, or ca. 1400 years until Luther, Calvin and the reformers to get the gospel right? 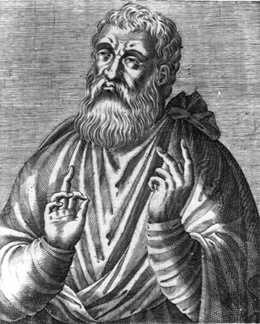 Both Justin and Irenaeus have a Christ-centered view of history and a Christ centered approach to the scriptures – primarily the OT; they both preach the crucified and risen Lord; they both have a trinitarian outlook – Father, Son, and Holy Spirit; they both describe salvation through Christ alone. Justin died for his faith. Irenaeus may have – but whether he did or not he was certainly willing to face death for his faith. Justin refers to Gen 1-3 several times in his Dialogue with Trypho. Adam is seen as the first man and, with Eve, the first sinner. There is no doubt that Justin took the primeval history in Genesis 1-11 both literally and figuratively. Now, we know that he did not go to the river because He stood in need of baptism, or of the descent of the Spirit like a dove; even as He submitted to be born and to be crucified, not because He needed such things, but because of the human race, which from Adam had fallen under the power of death and the guile of the serpent, and each one of which had committed personal transgression. But as my discourse is not intended to touch on this point, but to prove to you that the Holy Ghost reproaches men because they were made like God, free from suffering and death, provided that they kept His commandments, and were deemed deserving of the name of His sons, and yet they, becoming like Adam and Eve, work out death for themselves; let the interpretation of the Psalm be held just as you wish, yet thereby it is demonstrated that all men are deemed worthy of becoming “gods,” and of having power to become sons of the Highest; and shall be each by himself judged and condemned like Adam and Eve. Now I have proved at length that Christ is called God. A literal interpretation of Genesis is part of Justin’s hermeneutic – but Original Sin is not a part of his anthropology or Christology. Adam sinned and all sin of their own free will. 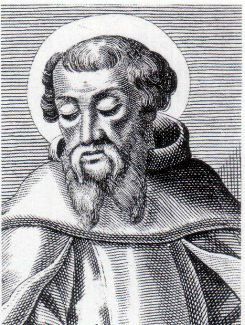 Irenaeus of Lyon (ca. 120-140? – ca. 202?) also read the OT with Christ at the center – and coined the term “Old Testament” (in Greek of course). The subject of Genesis, creation, and Adam and Eve comes up fairly often in the writings of Irenaeus – especially his best known work “Against Heresies” (AH). As a counter to Gnostic heresies Irenaeus was emphatic on creation ex nihilo – out of nothing. In the divine scheme of things, Christ comes first, then Adam. In effect the crucified and risen Lord comes first, and Adam is made with reference to him.The nature of the recapitulation, which puts Christ at the center of the human trajectory from creation to salvation, is therefore such that Irenaeus can speak of Adam as being made in the image of the incarnate Christ (AH 4.33.4)(p. 82). Irenaeus viewed Adam and his sin gently – the blame is transferred to the serpent. In AH 4.40.3 we read that the apostate angel and the enemy is cast from God’s presence as the one who brought about the transgression. God had compassion on the man, he removed his anger from the man, and cast it upon the serpent – whose head was crushed by the seed of the woman in the recapitulation of the crucified and risen Lord. As for Justin, Original Sin is not a part of Irenaeus’s anthropology or Christology. Bouteneff summarizes the second century apologists. Here I quote and/or paraphrase from pp. 86-87. 1. The overwhelming conviction in the nascent Christian church held that the Scriptures, in both the law they dictated and the salvation they promised, were transfigured in Christ. The OT was fulfilled in the words, character, and events in the person of Christ. 2. History was not a linear trajectory from Adam – first created perfect, then fallen – through sinful humanity to Christ and beyond. History began with the incarnate Christ, such that Adam was made in his image. 3. They emphasized creation out of nothing. God is creator of all. He did not reshape preexisting matter. And creation is Christ-centered. Here the ideas in the opening of John and the great Christological hymn of Colossians assume importance. 4. None of them were interested in commenting on Adam’s character as royal, pure, perfected, ignorant, or anything else. The sense is that Adam and Eve were like children not yet fully developed who partook of the intended fruit ahead of their time. They emphasize complete human freedom – in Adam and in those who follow. The sin of the first couple is linked to death, but this death is a merciful dispensation in view of the reality of sin (Theophilus and Irenaeus). Adam and Eve were the original sinners, but not the origin of sin. Is this significant for the way we think about the gospel and the creation narratives today? Or is it irrelevant? What can we learn from the view of Justin or Irenaeus or the others? If you wish to comment on this post please see A Second Century View of Adam on Jesus Creed. This entry was posted in Adam, Church, Death and tagged Peter C. Bouteneff. Bookmark the permalink.